Kirkwaa is the lairgest toun an caipital of the Orkney Islands, aff the north coast o Great Breetain. The toun is first mentioned in Orkneyinga saga in the year 1046 when it is recordit as the residence o Rögnvald Brusason the Earl o Orkney, who wis killed bi his uncle Thorfinn the Mighty. In 1486, Keeng James III o Scotland elevatit Kirkwaa tae the status o ryal burgh; modren roadsigns still indicate "The City and Royal Burgh of Kirkwall". The name Kirkwaa comae frae the Norse name Kirkjuvagr (Kirk Bay), which later chyngit tae Kirkvoe, Kirkwaa an Kirkwall. St. Magnus Cathedral in Kirkwall. Kirkwall in relation tae the rest o the Mainland. 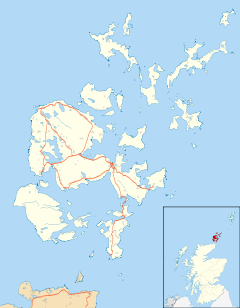 Situatit on the northren coast o Mainland Orkney an wi a population o aboot 9,000, Kirkwall is a port wi ferry services tae Aiberdeen an Lerwick, as well as the principal north islands in the group. At the hert o the toun staunds St. Magnus Cathedral, which wis foondit in memory o Saunt Magnus Erlendsson, Yerl o Orkney 1108–1117 bi Yerl (later Saint) Rögnvald Kali. Next tae the Cathedral are the ruins o the umwhile Bishop's Palace an Earl's Palace. The toun haes twa museums, the lairger bein Tankerness House Museum, which conteens items o local historical interest athin ane o Scotland's best-preservit saxteent century toun-hooses. The prehistoric, Pictish an Viking collections are o internaitional importance. The ither museum is the Orkney Wireless Museum, dealin wi the history o radio an recordit soond. Apairt frae the main historical biggins mentioned abuin, Kirkwall haes mony 17t–18t-century hooses an ither structurs in the local vernacular style. The 'Kirk' o Kirkwaa wis no the Cathedral (which wis oreeginally at Birsay), but the 11t-century kirk o Saunt Olaf o Norawa. Ane late medieval doorwey survives frae this kirk, an a aumbry frae the oreeginal kirk survives athin the late 19t Century structur o the present-day Saunt Olaf's Kirk (Episcopal) in the toun's Dundas Crescent. Kirkwaa forbye ance haed a medieval castle, which wis destroyed in the 17t century. On the wast edge o the toun, surroondit bi Hatston Industrial Estate, is a prehistoric auncient monument, Grain Earth House (Historic Scotland), a short law stane-wawed passage deep unnergrund leadin tae a smaw pillared chamber. This is the fuirm o yird hoose or souterrain characteristic o the Northren Isles (awtho Grain is unuisually deep belaw grund). It wis oreeginally connectit tae a surface dwellin, which haes syne disappeared, an the oreeginal purpose o these Airn Age structurs remains unkent. Further wast towards Grimbister is the similar Rennibister Earth House. Ane o the major annual events in the toun is the Ba Gemme, held each Christenmas Day an New Year's Day atween the Uppies an the Doonies, each team representin ane hauf o the toun. Kirkwall forbye haes the maist northerly o the warld's Carnegie libraries, which wis opened bi Andrew Carnegie an his wife in 1909. The biggin survives, awtho the librar itsel haes syne muivit tae a lairger biggin on Junction Road. As wi the rest o Scotland, Kirkwall experiences a maritime climate wi ceul simmers, mild winters, aften strang winds, plentiful rainfaw, frequently owercast skees an spairse amunts o sunshine. Kirkwaa wis a pairlamentar burgh, combined wi Dingwal, Dornach, Tain an Weik in the Northern Burghs constituency o the House o Commons o the Pairlament o Great Breetain frae 1708 tae 1801 an o the Pairlament o the Unitit Kinrick frae 1801 tae 1918. Cromarty wis addit tae the list in 1832. The constituency wis a destrict o burghs kent an aw as the Tain Burghs till 1832, an then as the Wick Burghs. It wis representit bi ane Member o Pairlament till 1918, when the constituency wis abolished an the Kirkwall component wis mergit intae the coonty constituency o Orkney and Shetland. The Orkney Library and Archive is locatit in Kirkwall. The composer Peter Maxwell Davies wis amang a group which foondit the annual St Magnus International Festival which is centred on Kirkwaa each midsimmer. Kirkwall Harbour can be seen in The Highlands and Islands – A Royal Tour, a 1973 documentar aboot Prince Charles' visit tae the Hielands an Islands, directit bi Oscar Marzaroli. Scots film-maker Margaret Tait wis born in Kirkwall, an mony o her films (in pairticular the Aspects Of Kirkwall series) are set thare. The Simpsons character Groundskeeper Willie is said to be frae Kirkwaa. ↑ "Kirkwall 1981–2010 averages". UKMO. Retrieved September 13, 2012. ↑ "St Magnus International Festival Website"
↑ "Full record for 'Highlands and Islands – A Royal Tour'" Scottish Screen Archive. Retrieved 21 June 2010. Wikimedia Commons haes media relatit tae Kirkwall. This page wis last eeditit on 24 November 2017, at 03:25.